I usually try not to post more than once a day, but frankly, I'm just too excited to wait! If you're a Ravelry member, you can get the pattern online here. You might also like Veera's blog which is filled with her gorgeous designs. Edited: I'm using the tag #SSSKnitalong to tweet about this KAL and will be posting some FAQs on the blog tomorrow so please add your questions to the comments below. I don't need to cast on anything else. I don't need to cast on anything else. I don't need to cast on anything else. So, is this project fit for beginners too? I want to join in but don't want to waste money on a pattern that I won't be able to knit ;-) What skills does one need to have to be able to make this? It's garter stitch on a 80cm (or longer) circular needle - it's knit flat but you need the length of the circular. 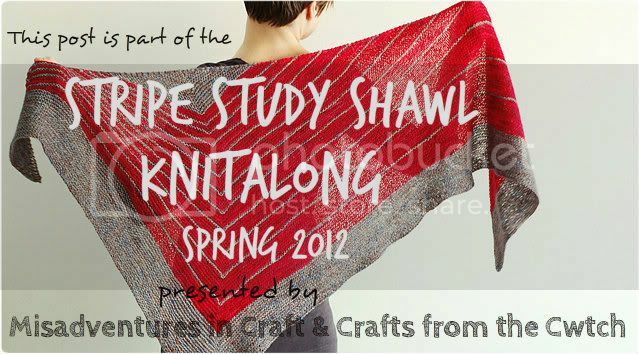 There are short rows (wrap and turn) for the shaping - you can see a tute here http://www.youtube.com/watch?v=G4GxFvi4KD0 - it's easy! What type of yarn are you using and what size needles - UK guage for both please! I'd love to try this but not sure I need to add to my stash, or that I have the right needles at present. Would you recommend any yarn which isn't too expensive to use - again purchased in the UK!!! THANK YOU!! Guage isn't crucial for this - but obviously the finished size will be affected. Using 4ply and 4mm needles it's 20 sts and 40 rows to 10cm/4" of garter stitch. Wow! that's amazing - and has given me some ideas - thanks! I have the yarn for this in a nice little project bag( I got it from FibreFest last year) but I'm not sure if my daughter would forgive me if I cast on something else before I finish her sweater!!! Will have to see! OMG!!! Tempting!!! I LOVE her shawls, esp. this one and haven't bought her patterns b/c I've been trying to be good since I have all these dang books I have yet to break in. To do or not to do...OMGosh!!! I'd love to do this but I have so much on at the moment! Can you go real slow and I can join in in May???! I'd love to join in this apart from the little problem that I still haven't learnt to knit. this shawls been in my list of things to make on ravelry for ages.